....Majority Vote enbloc; Minority Walk Out After a drawn out debate, which culminated in the minority staging a walk out, Parliament has confirmed the nomination of three ministers-designate whose confirmation was deferred last month. The three, Dr. Richard Anane for Roads Transport, Sheikh I.C. Quaye for Greater Accra region and Isaac Edumadze for the Central region had their confirmation delayed because the Appointments committee decided further investigations were required to clear some allegations brought against them. 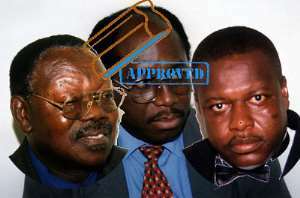 Dr. Anane and Sheikh I.C.Quaye received 120 votes representing all members of the majority present. In the case of Mr. Edumadze, 116 gave him the nod while three abstained. One ballot was declared invalid. The voting took place after members of the minority had staged a walked out of parliament due to disagreements over the conduct of the secret balloting system. The minority had requested that members be allowed walk to the ballot box and cast their vote as is done in elections but after heated arguments between the minority and majority sides, the speaker ruled members should vote in their seats. The minority spokesperson on communications John Mahama said the procedure would affect the integrity of the secret ballot.